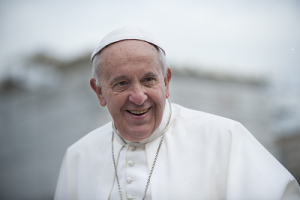 Foster a visible, active and growing culture of Gospel-centric peace and justice within our parish. We have some exciting plans for the new year, including a Peace & Social Justice film series, a robust education/advocacy campaign, thought-provoking speakers, a fair-trade market, and a human trafficking event. We invite you to learn more about us and how you can get involved in being the hands of feet of Jesus Christ to the world. 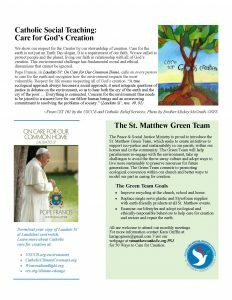 For the Green Team’s 50 Ways to Care for Creation article, click here. A short discussion will follow. Enjoy free popcorn and fellowship. To volunteer or ask a question, contact Michael Burck. New to volunteering at St. Matthew?Please read our Safe Environment Policy.